What makes LOSITTO DIFFERENT? Exquisite leather with thorough stitching, this wallet will last you for years! All of our LOSITTO Collection wallets use the "gold standard" of RFID blocking technology for HIGH and LOW frequencies. Most RFID blocking wallets only cover high frequencies. This wallet also has the following elite features: -1 ID windows for quick access and view (Standard International ID size / 3.5 inches wide opening) -Tested RFID blocking capability for cards in the 10 MHz to 3000 MHz range and 125KHz -Blocks NFC equipped readers and smartphones -9 credit card slots -Additional 3 slots behind the credit card slots -Two spacious currency compartments -100% Hand-crafted full grain leather imported from Italy, it is soft and comfortable. -Wrapped in a cloth bag, then beautifully packaged in a designer gift box. GENUINE LEATHER: Made Of Italian Vintage Vegetable Tanned Top Grain Leather with nice and smooth texture, really soft & comfortable to touch. Vegetable tanned Leather is a luxury leather. It uses natural ingredients instead of chemicals, so it is environmentally friendly. SAFETY & PRIVACY - Equipped with advanced unique military grade proprietary blocking material, engineered specifically to block 13.56 MHz or higher RFID signals and protect the valuable information stored on RFID chips from unauthorized scans. MULTI FUNCTION - Wallet size is 4.5" x 3.5''x 0.7" (folded, empty) .Designed Side flip ID Window allows quick access to driver's license, a convenient feature for those who travel. Equipped with 12 card slots, 2 currency pockets, 1 ID window, meets all your daily needs! GIFT BOX PACKING: It is one of the most special gifts for Groomsmen, Birthdays, Anniversaries, Father's Day, Christmas and other Special Occasions. 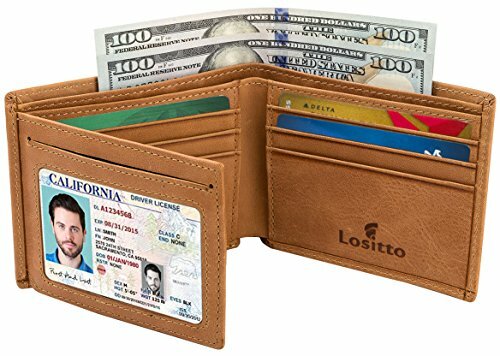 100% LIFETIME MONEY BACK GUARANTEE: Happy customers give Lositto RFID Blocking Leather Wallet high ratings, so we're confident that you'll love it! We're SO confident that you'll love this wallet that it's backed by our 100% Money Back Guarantee. If you don't love it *for whatever reason* we'll replace it or give you every cent back. That means that you either love it, or it's free! If you have any questions about this product by Lositto, contact us by completing and submitting the form below. If you are looking for a specif part number, please include it with your message.